12 | TH E M R EP O RT FROM THE SOURCE Knowledge WHY LIA? The Largest Provider of E&O Insurance to AMCs in the U.S. SINCE 1977 POLICIES SPECIFICALLY DESIGNED FOR AMCS COMPETITIVELY PRICED COVERAGE NATIONWIDE COVERAGE WITH "A" RATED COMPANIES STATE AMC BONDS WITH NO ADDED FEES Contact Susan Lomeli Susan@liability.com Ph: (800) 334-0652 X 139 Fax: (805) 962-0652 www.liability.com CA License #0764257 Administrators & Insurance Services LIA_AMC_Print_Ad_Knowledge_2.2917x9.125.indd 1 2/11/15 7:18 PM READ THIS ∂ HIDDEN IN PLAIN SIGHT: WHAT REALLY CAUSED THE WORLD'S WORST FINANCIAL CRISIS AND WHY IT COULD HAPPEN AGAIN Following the Great Recession, public sentiment roared against Wall Street and the mortgage banking industry. Dodd-Frank made its debut, and the industry is still trying to navigate the new landscape paved by the myriad regulatory demands. Hidden in Plain Sight: What Really Caused the World's Worst Financial Crisis and Why It Could Happen Again presents oft-ignored data that demonstrates how government policies led to the massive foreclosures that occurred in 2007 and 2008. The book goes on to state that while some cling to Dodd-Frank as a security against another financial crisis, there is mounting evidence that the behemoth piece of legislation is actually hurting the economy and delaying a full financial recovery. SHARE THIS TEN-X HOMES Online real estate marketplace Ten-X (for- merly Auction.com) recently announced its new transaction platform created especially for buying and selling move-in ready homes. Ten-X Homes was rolled out at the South By Southwest Interactive Festival. Ten-X Homes will allow consumers—on their own or with the help of a real estate agent—to do everything involved in the process of buying and selling a home. Users will be able to search for homes, easily create their own property listings, negotiate prices and terms, manage offers, and complete sales transac - tions all online. WATCH THIS THE SEMI-ANNUAL REPORT OF THE CFPB In his first appearance before the House Financial Services Committee since September 29, Consumer Financial Protection Bureau (CFPB) Director Richard Cordray sat before the committee in March to defend his and the bureau's recent ac - tions. Cordray faced intense criticism from the committee's Republicans, particularly Chairman Jeb Hensarling (R-Texas), who said Congress has made the director a "dicta- tor" and given him power that is "amazing, frightening, and tragic." The director touted many of the bureau's accomplishments in his opening statement, such as last June's expan- sion of the Consumer Complaint Database to include consumer narratives, a new series of monthly reports to highlight key trends from consumer complaints submitted to the CFPB, which the bureau began publishing last July, and the Ask CFPB online tool, which includes more than 1,000 answers to questions about various financial products. 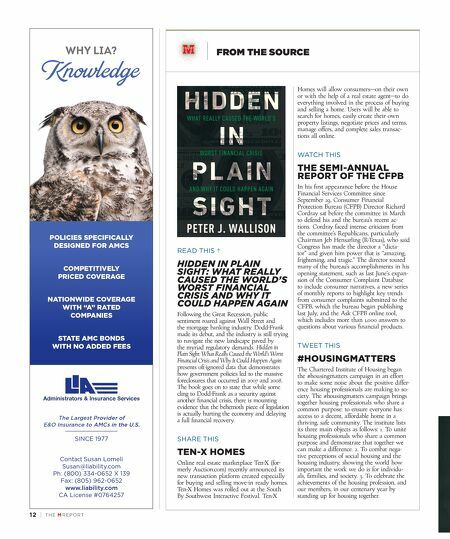 TWEET THIS #HOUSINGMATTERS The Chartered Institute of Housing began the #housingmatters campaign in an effort to make some noise about the positive differ- ence housing professionals are making to so- ciety. The #housingmatters campaign brings together housing professionals who share a common purpose: to ensure everyone has access to a decent, affordable home in a thriving, safe community. The institute lists its three main objects as follows: 1. 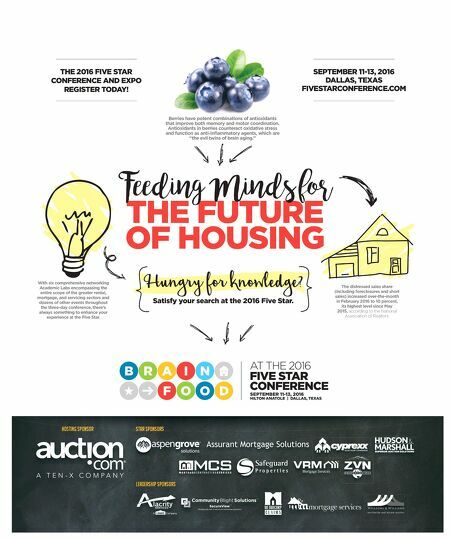 To unite housing professionals who share a common purpose and demonstrate that together we can make a difference. 2. To combat nega - tive perceptions of social housing and the housing industry, showing the world how important the work we do is for individu- als, families, and society. 3. To celebrate the achievements of the housing profession, and our members, in our centenary year by standing up for housing together.